Original Editors - Nick Hansen & Ren Peterson from Bellarmine University's Pathophysiology of Complex Patient Problems project. The spleen is an organ of the lymphatic system located on the left side of your stomach (abdomen) under the rib cage and diaphragm in a region that is referred to as the left upper quadrant. In humans the spleen is about the size of a fist and its primary roles are filtering the body’s blood and helps to fight infection. It also serves a role in storing and releasing certain types of immune cells that mediate tissue inflammation. Rupturing a spleen describes an emergency situation in which your spleen has developed a disruption in its surface or blood supply. This is serious condition that can occur during a direct blow or trauma and without emergency treatment a ruptured spleen can cause life threatening internal bleeding. The prevalence of splenic ruptures are poorly documented but one study suggest that traumatic splenic ruptures are more likely to occur in males (2:1 male to female) with ages ranging from 18-34 years. Castell’s Percussion Test: Clinical Screen for the presence of splenic inflammation. Clinician palpates the left costal margin near the anterior axillary line. Clinician then instructs the patient to breathe normally while they apply percussion at both full inspiration as well as at rest. Normal it is only dull at full inspiration and should be tympanic at rest. It is strongly advised to seek immediate medical care if an injury is sustained coupled with pain in the left upper stomach (abdomen) region along with any of the above listed signs and symptoms. If severe injuries are untreated a ruptured spleen can be fatal. 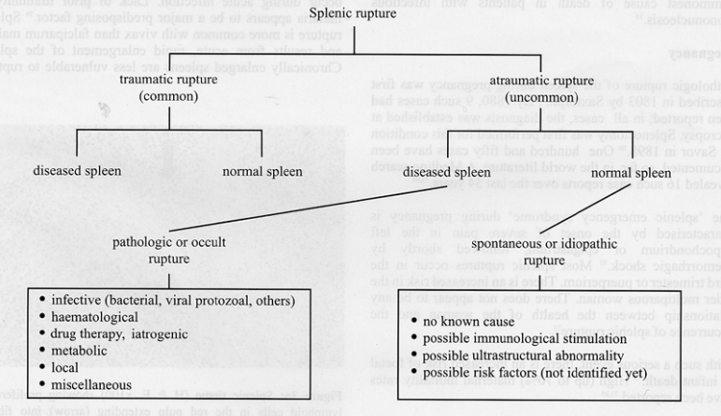 Non-traumatic splenic ruptures can be associated with numerous conditions and diseases. Some of the most common include, lymphoma, cirrhosis of the liver, liver disease, pancreatic pathology, bone marrow disorders such as leukemia, and blood clotting disorders. Viral diseases that can lead to splenic rupture include mononucleosis, malaria, and in rare cases HIV. Other conditions that can lead to splenic include drug addiction, sickle cell disease, and prolonged use of blood thinners. Splenomegaly can often be a primary symptom of Epstein Barr Virus (EBV). 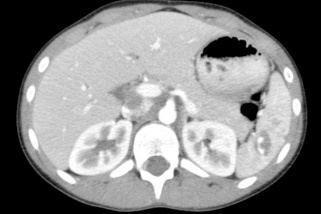 Splenic enlargement from the virus is associated with adenopathy as the virus places stresses on the immune system of which the spleen plays an important role. Clinicians should be aware of associated signs and symptoms of EBV infectious mononucleosis in order to refer out and provide the patient with proper medical treatment before a potential splenic rupture. No medications are prescribed to heal severe splenic ruptures, there are medications and vaccines recommended post-surgical removal of the spleen (splenectomy) in severe injuries. • Blood tests such as a complete blood count to check the number of red blood cells, white blood cells and platelets in your system. • Ultrasound or computerized tomography (CT) scan to help determine the size of your spleen and whether it's crowding other organs. This is the most common test used to diagnose a splenic rupture and can be supplemented by an x-ray. Spleen, trauma. Chest radiograph shows a peripherally calcified mass in the left upper quadrant under the diaphragm. 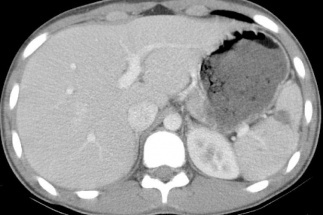 The mass represents a calcified splenic hematoma. Spleen, trauma. 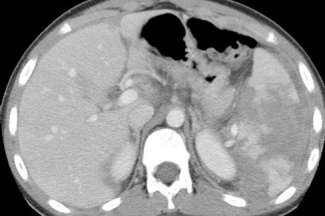 Contrast-enhanced CT scan shows a localized area of dense contrast collection in the splenic hilum, with a massive amount of surrounding fluid/blood. 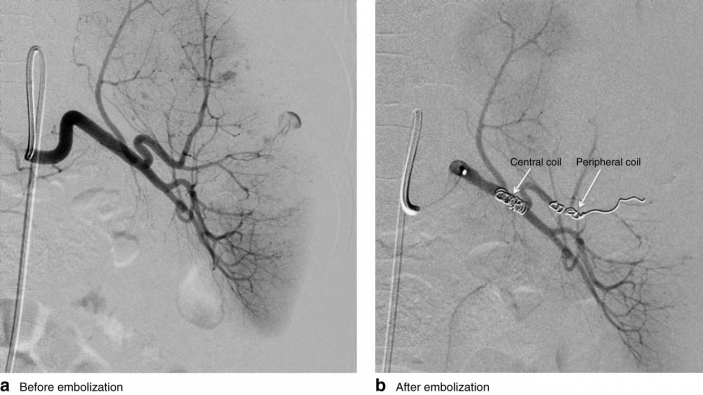 Findings here are indicative of active extravasation of contrast in a patient with traumatic autosplenectomy. This is a grade V injury. Grade I - Subcapsular hematoma of less than 10% of surface area. Capsular tear of less than 1 cm in depth. Rupture of the spleen can lead to life threatening bleeding into the abdominal cavity, which will lead to low blood pressure and decreased oxygen supply to the heart and brain. It is a medical emergency and should be referred to the emergency room immediately. First case control study on operative vs. non-operative management by Upadhyaya and Simpson in 1968 suggested that isolated splenic injuries could be safely treated without surgery in children. Pediatric surgeons led the way during the following decades, and non-operative management is now reported to be successful in more than 90 percent of children with isolated blunt injuries. 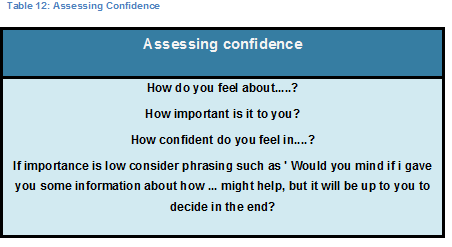 • Close observation for up to 2 weeks, including an initial period of observation in an intensive care unit (ICU). o Systolic Blood Pressure less than 100 mm Hg. o Heart rate greater than 120 beats per minute. o Lack of response to a fluid challenge of 2 L of a crystalloid solution. Physical therapist must be able to recognize the signs and symptoms of spleen rupture. In sports, splenic rupture is the most common cause of death due to abdominal trauma, it is vital that clinicians perform a through exam of the patient. Patient Education: Most splenic ruptures can be rapidly progressing, while others can delay hemmorrhage for hours, days, or even weeks after injury, until a suffient enough force causes rupture. It is vital that we education patients about the signs and symptoms so they can seek medical care immediately. Post-operation: encourage ROM, ambulation, and coughing techniques (splinted coughing). Most traumatic splenic ruptures will not be seen in physical therapy. -23 year old male university hockey player "Eric"
Player continued a conservative approach to return to sport in that he decided to not to play varsity hockey the following season, taking at least 1 year off. - Patient is a 40 year old female middle school teacher who was recently involved in an automobile accident in which she was T-boned in an intersection three days ago. - She reports no major injuries but comes to physical therapy for L shoulder pain and difficulty breathing since the accident. - Feeling of "racing heart"
- After X-ray and CT scan confirmation of ruptured spleen and peritoneal hemorrhaging, surgical correction was performed to stop abdominal bleeding and splenic rupture. - Physical therapist demonstrated excellent clinical judgement in the situation when deciding to refer the patient which resulted in a life saving scenario. ↑ A Dictionary of Nursing. 2008. Kehr’s Sign. 29 Mar. 2012 Available at: http://www.encyclopedia.com/doc/1O62-Kehrssign.html. ↑ Examination of the Spleen. Examination of the Spleen | Stanford Medicine 25 | Stanford Medicine. 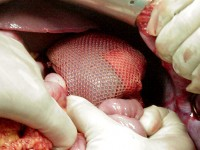 http://stanfordmedicine25.stanford.edu/the25/spleen.html. Accessed April 4, 2017. ↑ Infectious Mononucleosis Differential Diagnoses. Infectious Mononucleosis DifferentialfckLRDiagnoses. http://emedicine.medscape.com/article/222040-differential. Published January 6,fckLR2017. Accessed April 4, 2017. ↑ Mayo Clinic Staff Print. Diagnosis. Mayo Clinic. http://www.mayoclinic.org/diseases-conditions/enlarged-spleen/diagnosis-treatment/diagnosis/dxc-20214826. Published August 3, 2016. Accessed April 4, 2017. ↑ 14.0 14.1 Klepac S. Spleen Trauma Imaging. Medscape.http://emedicine.medscape.com/article/373694-overview (accessed 22 March 2012). ↑ YDS. How Much Force to Rupture a Spleen: Sport Science. YouTube. https://www.youtube.com/watch?v=uQp9iwVzN5Q. Published July 15, 2014. Accessed April 4, 2017.